from my "unpublishable" mp3 archive, a collection of over 400 new and old pieces. Have another look in there once in a while as I keep adding new stuff now and then. 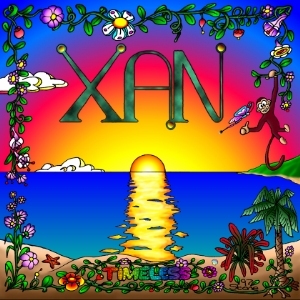 All music composed and performed by XAN, published by Alexander Stone Music. If you wish to purchase this CD please contact me directly until the order form returns. Where did it go anyway? Music has always been my passion. I've been playing since I was four or five years old. I started by playing the recorder then the harmonica and found myself drawn to church organs but rarely was given the opportunity to play one, and none ever materialized under the Christmas tree. Thanks a lot Santa! One day I found a guitar that my mom had left behind and by the time I was thirteen I bought my first electric guitar. Soon after I formed my first band with three other kids from school, we called it Black Light Blues. It was fun while it lasted but when I turned fifteen I dropped everything I was doing, including the band and just played when I felt like it. By the time I turned eighteen I realized that I was making no progress and following the advice of a friend who played much better than me after only a year, I started practicing daily for one or two hours. Needless to say that it made a big difference. Still I didn't perform in public for a long time, just shredding crazy guitar solos in my room using my Amiga computer for the background music, at the expense of my neighbors.. I like to play at night! Without knowing why or how, my inspiration slowly drifted and started sounding more and more like classical music. One day some friends heard one of my classical piece, the one called Medieval, and insisted that I play that kind of music live. At the time I didn't really understand what they liked about it but since I was going broke I figured I might as well try. I started playing on the Venice boardwalk and the first day I made, well... five bucks. That didn't sound like much but it certainly was enough for a meal. I kept doing it each weekend and gradually made more and more each time. Thanks to an arbitrary city ordinance forbidding any modern technology rather than excessive noise levels, I could no longer perform on the boardwalk and took my act to Santa Monica's 3rd street promenade. Although it wasn't half as fun as Venice, there I found a very appreciative crowd and the tips were sufficient to cover both my rent and food just by playing 2-3 times a week. As so many people asked for a recording, I eventually got to work and recorded my first CD. It took me three years but I did it eventually. A year later I gave up on the 3rd steet promenade as things turned ugly. It was becoming difficult as too many musicians started playing there for me to be able to even hear myself as I like to keep my volume relatively low. Then corporate plans to take over that street lead the local PD on a street musicians harassment campaign which made playing there rather unpleasant. Ever since I've been doing more professional work such as studio sessions, short movie soundtracks, private events and small concerts as a solo act and with other artists, depending on what comes along. It doesn't offer the same exposure but it's definitely more peaceful than my previous outdoor settings, although I do miss street performances for the magic of reaching the soul of the unsuspecting passer-by. At about the same time I decided to put all my music on the then new mp3.com website and must say that it worked out really well. That same old piece "Medieval" quickly reached the top 10 of the classical/medieval chart and stayed there for several months and with some other pieces kept me in the top 40 for 3 years straight. Looking at the stats I always got a warm feeling at the idea that in so many places around the world people were listening to my music. It's just so weird. All in all, my music was played more than 80000 times in those three years. It's too bad mp3.com was bought by Vivendi/Universal who immediately switched from paying royalties to charging the artists instead and now sold the site to c|net who temporarily closed it down while they turn it into some possibly unrelated site. Still, I am grateful for the exposure mp3.com provided while it lasted. For now I hope some people will find their way here to download the music. As time permit I'll add more music until I'm ready to release a second album. RIAA, MPAA, DMCA and other four letter words that don't spell LOVE. Being a musician and a publisher, it is my duty to dispell the myth surrounding mp3 files sharing. SHARING DOES NOT HURT THE MUSIC INDUSTRY. Ignorance and greed combined with lousy album releases do. Let me explain. The RIAA (in essence the big 5 U.S. record labels) complained that since people started sharing mp3 files via the internet, record sales have dropped and they've lost several millions in profits. Joining forces with the MPAA (mostly the movie side of the same businesses) they also lobbied the government and got a new law passed, the Digital Millennium Copyright Act, a questionable law you might want to read just to see what greed can do to the Constitution. What they fail to mention is that most of the albums they released during those same years were targeted at pre-teens and that the music was so bad that no amount of hype and media coverage could help them sell it. Adults make and spend more money than kids, especially on music, so targeting kids (because they're easier to influence) was a poor business plan to begin with, and manufacturing bands what the other bad move. The other fact they don't like to mention is that they still made BILLIONS of dollars during those years, of which only a very small share went to the artists by the way (less than 2% in most cases). Finally, there's no question that the audio quality of mp3 files does not compare with the original CD and also that most people prefer buying CDs to downloading because of the artwork, pictures, lyrics, etc, that is, if there's anything worth buying of course. You'd think the RIAA would learn from their mistakes and move on.. Nope. It more lucrative to blame others. I guess common sense never stopped greed, judging by the state of the environment. Here's where I stand: Writing and recording my album took time and money, once. Duplicating the CDs costs me money for each copy. That's why they're not free. On the other hand, when some fans copy and distribute mp3s of my songs it doesn't cost me anything, in facts they're doing my promotion work for free! As the copyrights holder I get to decide what people can do with my music, not the RIAA and definitely not the DMCA. For good measure and to help balance the universe I've granted you the right to play, copy and share my mp3s. If enough musicians do the same, it will make a difference. Besides, it helps making an informed decision if you can listen to all the songs on an album before you buy it, and having free access to countless mp3s allows you to discover artists you might never see on TV or hear on the radio.